A sculptor born and bred in Vermont is soaring to star status in the Manhattan art world. The New York Times recently attested to — and assisted — his ascent with a profile and online slide show of some of his pieces, which he makes and stores in his quirky home on a weedy lot in Brooklyn. Lars Fisk, 45, traces his success to his native state. Two years after graduating from the University of Vermont in 1993, he became Seven Days' first art director. He has long been associated with Phish as a designer of sets and spectacles for the jam band's concerts. And, perhaps most portentously, it was during a drive along Interstate 89 that Fisk was struck with the inspiration for making the spherical sculptures that have become his signature motif. "It happened in 1996 as highway hypnosis," Fisk recalled. "I started seeing the road kind of roll up into the horizon. It looked to me like a big ball." He soon began making rounded pieces that "turn landscape into objects, places into things." Fisk offered that origins story in an interview earlier this month at Marlborough Chelsea, the Manhattan gallery that's hosting his show, titled "Mr. Softee." About a dozen of his amusing and sometimes amazing transpositions are on display at the venue. Pascal Spengemann, another New York art-world luminary with strong Vermont connections, has been director there for the past four years. Spengemann, also 45, has been friends with Fisk, who was raised in Norwich, since their high school years in Hanover, N.H. They later shared living space in Burlington's South End. Serendipitously, the apartment was adjacent to Dionysian Productions, Phish's management company. Spengemann, who holds an art history degree from the University of New Hampshire, served as curator of Church Street's Firehouse Gallery (now the BCA Center) from 1995 to 2004. Taking a break from installing "Mr. Softee" in the ground-floor space on West 25th Street, the two buds reminisced about their lives in Vermont. They jointly embarked on a magical memory tour back to the Daily Planet, where, 20 years ago, Fisk and Spengemann hung out and got to know established Burlington artists including Lance Richbourg, Barbara Zucker and Michael Oatman (now an associate professor at Rensselaer Polytechnic Institute in Troy, N.Y.). The old hands spun what Spengemann referred to as "war stories" about their careers and the local art scene. "They passed on so much information to us," Spengemann testified. "Their experiences were of great interest to us." Fisk added: "It was a whole different kind of education. We learned things you don't learn in college." The two also spoke about how Burlington compares to New York as a place for artists to create and for curators to orchestrate and to nurture. Isn't it almost impossible, the duo was asked, for someone to make a living as an artist in Vermont? "It's almost impossible to support yourself as an artist anywhere," Spengemann replied. "New York does have an infrastructure of galleries and museums, which is the best thing about being here. But New York is also very expensive. It's getting harder and harder for people to come here and make it as artists." Fisk advised: "If you're going to go for it and try to make your way as an artist, it's important that you learn to suppress your standard of living. "I feel very fortunate to do what I do," he continued. "And I'm only able to do it here. Actually, though, I was doing it in Burlington, too, but I was living like a homeless man there." That's not to imply that Fisk is luxuriating in a Park Avenue penthouse these days. His home consists of four shipping containers he's stacked two by two in a vacant lot in the Red Hook section of Brooklyn. This postindustrial urban homestead had previously been situated next to a parking lot in Astoria, a neighborhood in Queens that hosts both a Costco warehouse and the Socrates Sculpture Park. Fisk worked for seven years as facilities and studio manager of the outdoor art site that took root in East River landfill. From his containers, he could take in a drop-dead view of the Manhattan skyline. Its nighttime glitter might be the consummate expression of New York's sheen in the 21st century. Look beyond the bright lights and the big money, however, and it's easy to see the funk that persists in outer-borough neighborhoods such as Astoria and Red Hook. And it's the everyday sights of that unsung side of Gotham that Fisk celebrates in his sculpture. At Marlborough Chelsea, he explained, "I'm exploring the iconography of the cityscape." "Mr. Softee" opens with a lovable rendition of one of the soft-serve ice-cream trucks that ply the city's downscale streets. Fisk's balled-up version, the size of an overinflated party balloon, doesn't play the grating jingle familiar to generations of New Yorkers, but it is a faithful, if oddly shaped, reproduction in all other respects. The piece is emblazoned with the red-script Mr. Softee logo and images of some of the treats ostensibly on offer; its windshield is even equipped with wiper blades. 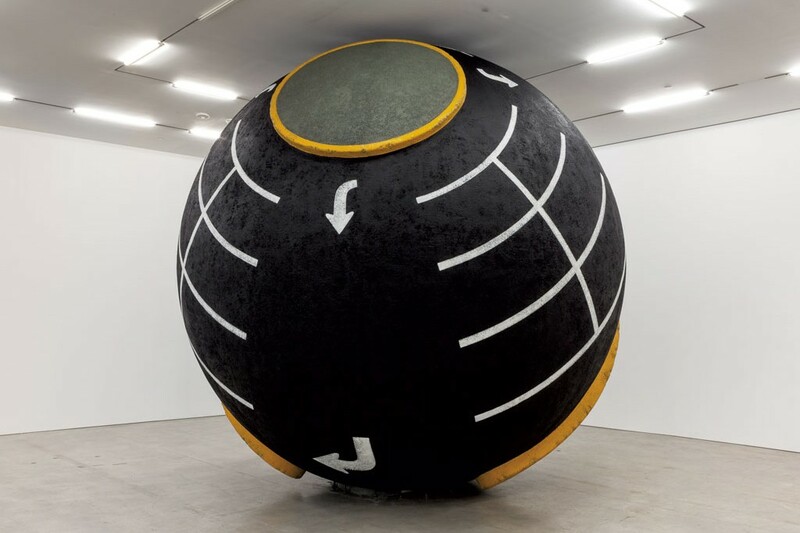 The show also includes a trash can, a cobblestone street, the mosaic-tiled walls of three subway stations and a self-storage warehouse — all of them converted into smaller-scale spherical forms. 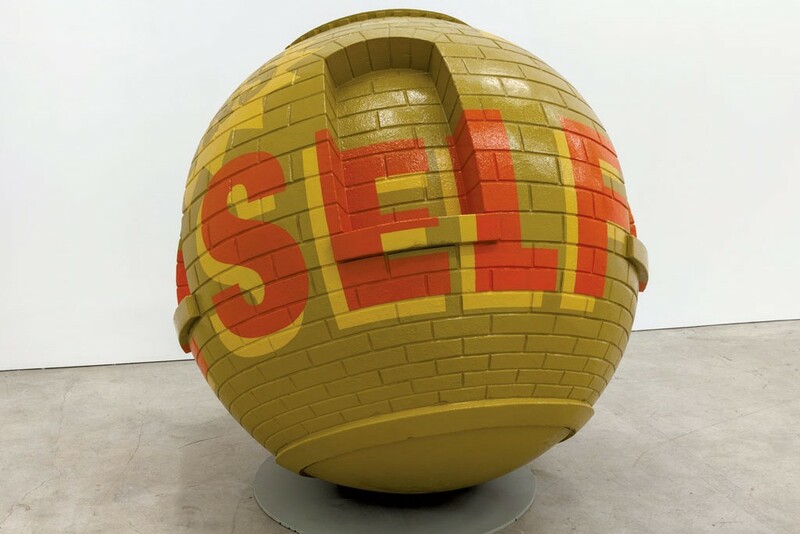 In dimensions and sales price, the works range from marble-size pencils (which go for $8,000) to a 15-foot-diameter object that almost touches the ceiling in the gallery's tallest room — that will cost a buyer $250,000. This looming piece, which may startle viewers, has a black surface with a few intersecting white lines and some circular and oblong orange-and-gray protrusions. A few moments of contemplation, along with prior exposure to Fisk's wry sensibility, will reveal "Lot Ball" as a brilliantly wacky take on, yes, a parking lot. And not just any stretch of asphalt. This astonishing sphere is based on the Costco parking lot that Fisk looked at every day from his container home in Queens. "I made it large to suggest that parking lots are taking over," he said. 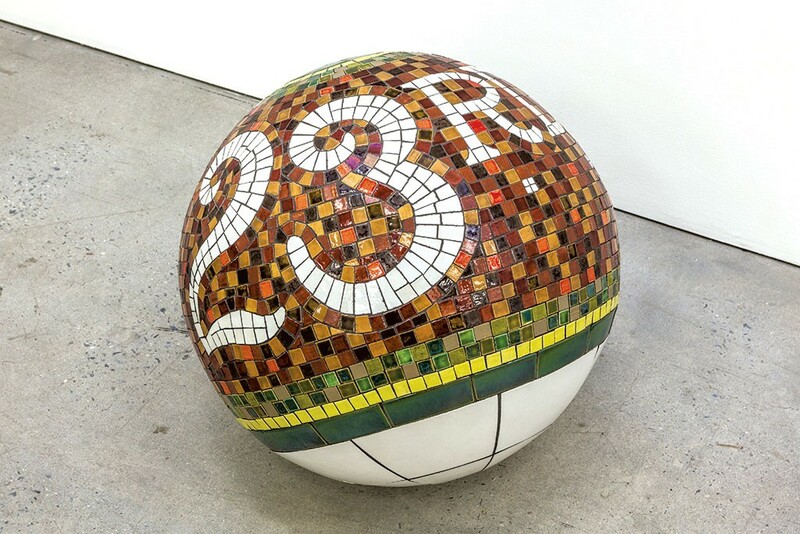 It took Fisk months to make "Lot Ball" and several weeks to complete the smaller pieces seen at the Chelsea gallery. "All the material has to be manipulated, and some of the materials are more problematic than others," Fisk noted. He had to bend granite, for example, to shape one of the pieces. "Lot Ball" consists of polystyrene covered with asphalt. Several Vermonters traveled to New York to attend the September 8 opening of "Mr. Softee." Locals can see samples of Fisk's work much closer to home, too. "Train Ball" is housed, aptly, in the track-level lobby of Union Station in Burlington, while "Barn Ball" brings a rustic touch to the admissions area of UVM's Fleming Museum of Art.